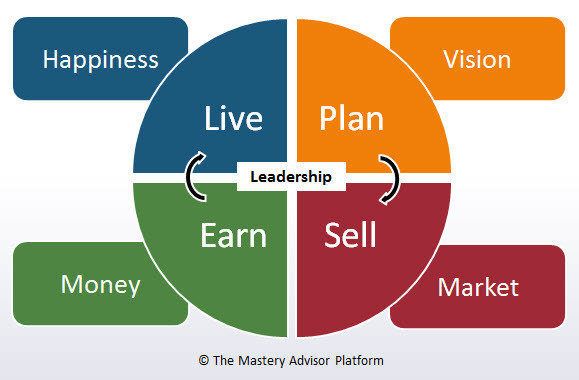 The Mastery Advisor Platform™ (MAP™) is the 9-step path to moving your sales business from commodity to mastery. The Mastery Advisor Platform™ provides the road map for sales professionals to stop having to chase business and constantly “sell”, while getting beat up over price. MAP™ helps you avoid burnout while your business and sales grow. It helps you develop a business that is special, and makes you more valuable than ever to your clients and partners. The 9-step path to more money, less stress, and more life. While most independent advisors in the mortgage, real estate, and financial industries, work hard to sell more and convert more prospects into clients, they miss critical pieces of the big picture of running a successful business. Some achieve great sales success, while others flounder year after year. The accolades and rewards for the top producers can numb the fact that they don’t enjoy their business and are feeling burnout. After enough years, working longer and working harder become unacceptable But if you don’t know any other way, what choice do you have? I have found that by focusing on NINE key areas of my business, rather than just marketing and selling, my world suddenly got easier. I realized we must work to master all nine areas throughout our career in order to truly enjoy more money, less stress, and more life! At the core, there are four areas: Plan, Sell, Earn, and Live. But to master these four areas, there are five other critical areas of our business we must work on. To create a truly effective business PLAN, we must have a compelling, detailed, and written business VISION. To SELL more, and SELL easier, we must learn how to MARKET ourselves so good that the need to “sell” goes away and we can do what we love…consult and advise. Mastering these first four phases makes it easy to EARN more than ever before. But how much is enough? Sales professionals need to understand MONEY at a higher level and learn how to define financial independence in their eyes. Otherwise, we find ourselves with the “more is better” disease. Once we truly understand money, we can comfortably and confidently begin to LIVE and enjoy the fruits of our labor. Driven professionals (like myself) are notorious for filling every free moment with trying to grow their business and make money. We do this because we have not yet learned how to define what makes us HAPPY, and instill the proper perspective and habits in place to believe that this is the most important objective above all. To cap everything off, LEADERSHIP is the glue. By studying leadership, and growing as a leader to those around you, the other eight areas succeed. In creating this 9-step platform, I have discovered and created specific tools and strategies that is helping me master each area of the MAP™. Is it really possible to ever truly master something? I’m not sure. But I do know this platform has brought more simplicity, balance, and focus to my life and career than ever before. And now I share some of this with you. Welcome to my road MAP™ for coaching and inspiring you to grow your business and improve your life!